Some people learn Japanese with websites and language programs. Others learn with apps. And others love textbooks. What are the best Japanese textbooks for learners? Here, you will find the top 10, tried, tested and true Japanese language books. They’re used in colleges. They’re used in language schools in Japan. So, you will definitely be in safe hands with any of these. So, scroll down and take a look! 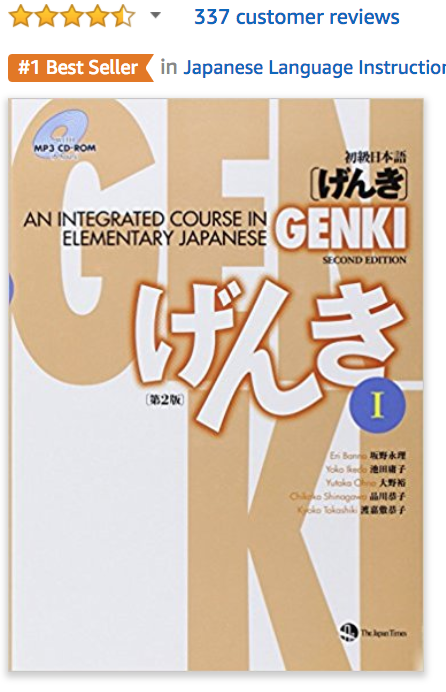 Genki is one of the best Japanese textbooks out there. Schools use it. Universities use it. Language schools in Japan use it. This is the mother (or father) of all textbooks and a very safe start to your Japanese journey. Inside, you get 382 pages 24 chapters and 2 parts — conversation/grammar and reading/writing each with 12 chapters a piece. This book will get you reading, writing and mastering basic Japanese. There also are dialogs and exercises to test you. This is the accompanying 148-page workbook for the Genki textbook. When I was in school, we had to get it and use in conjunction with the textbook. Do you need it? Well, no. But, if you want to practice and improve your Japanese, it will do that for you. Minna No Nihongo, which means “everyone’s Japanese” or “Japanese for everyone” is other mother of Japanese textbooks. If your school didn’t use Genki, it used this. Some people like it more than Genki too. But just like Genki, it will teach you to read, write and understand Japanese across 248 pages. It’s designed for beginners and is a safe way to learn Japanese. Warning: It doesn’t use any English and forces you to swim in Japanese from the start. Yes, you check the accompanying translation book for help, but it may be challenging for some. This is also one of the most popular and best Japanese textbooks. This 296-page book also comes with a CD so that you can listen to the dialogs. It’s also romanized, meaning you don’t need to know the Japanese alphabet – hiragana and katakana – to read it. Here, you learn survival Japanese; just enough to get around Japan. You learn all the words and grammar used in survival Japanese, plus a bit of culture as well. This is probably the easier of the books in this best Japanese textbooks list. Don’t let the title deceive you. This on the list of best Japanese textbooks because it’s easy. It makes grammar easy. Plus, it focuses on spoken Japanese so you’re not getting “dry, made-up” conversations. The goal of this 408-page textbook is to prep you for a trip to Japan, so you’ll learn language revolving around that. You also get a CD with dialogs presented in the book. The only setback? It uses romaji. This means that you won’t learn the Japanese alphabet here. But don’t worry, if you’re a brand new, scared beginner, this is will do the job. This is a whopper of a Japanese textbook. And that’s why it makes the list. You get 3 course books: one for beginner level, one for intermediate and one for advanced. You also get 9 CDs; 3 for each level. As with all beginner textbooks, this package aims to get you speaking, reading and writing Japanese. In terms of learning material, it’s very organized but the one critique is that they use too much English here. Some like that. More serious learners do not. People love this book in particular because of the price. Genki can be quite expensive so this is where this book comes in. You get 14 chapters across 400 pages and a CD with this package. Like other beginner Japanese textbooks, it’ll teach you Hiragana, Katakana, some Kanji and plenty of grammar and reading. After chapter 2, they drop Romaji forcing you to put your Japanese alphabet skills to use. That’s a good thing. In order to learn Japanese, you will need to learn tons of words. Picture books like this Visual Dictionary make it easy. Instead of drilling word lists, you can review the images. It’s divided into themes like “People,” “Appearance,” “the Anatomy” “Health” and much more. I wouldn’t call it a dictionary but rather a vocabulary builder. Dictionaries are boring but this is fun to take out and read through. If we’re going to talk about best Japanese textbooks, we can’t skip Kanji. Kanji are the Chinese characters used in Japanese. You will need to learn them if you want to read Japanese like a pro. This is where this book comes in. Not only will it prep you for the N4 and N5 proficiency tests, but you will master 430 Kanji in total. …you’ll need grammar. Lots of grammar. Luckily, this is one of the easier and cheaper Japanese textbooks for grammar. It’s very nicely designed and color coded! Across 400 pages, you’ll learn grammar points with explanations, examples and a ton of practice exercises to solidify your juicy Japanese knowledge. I LOVE books like this that have exercises and force you to write things out. These are some of the best Japanese textbooks around. 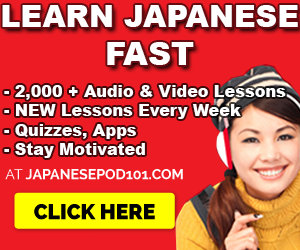 Now, if you’re looking for a Japanese learning program, then I recommend JapanesePod101. They have a ton of audio and video courses, apps, PDF ebooks, and everything you need to learn Japanese fast and easily. Click here to visit them and get a lifetime account. Don’t worry, learning with books is a safe way to learn Japanese. Books won’t distract you like apps will. Books keep you focused from page 1 until the end. If you have some quiet time to learn Japanese, a good textbook will repay you more than what you’ve spent on it. So, what are your favorite Japanese learning books? They don’t have to be textbooks. Want some other Japanese resources?